As a portrait photographer, there are certain things you do every time you meet with a client, shoot a session, place an order, etc. Collectively, these activities would be referred to as your workflow. Creating processes for these activities and utilizing software to help you automate your workflows can be one of the best things you do for your business. Reviewing your workflow and designing it with intentionality will help you stay on track and be more efficient, but will also ensure a level of consistency that your customers will appreciate. In this article, we will walk step by step through the mechanics of designing a portrait session workflow in 17hats. 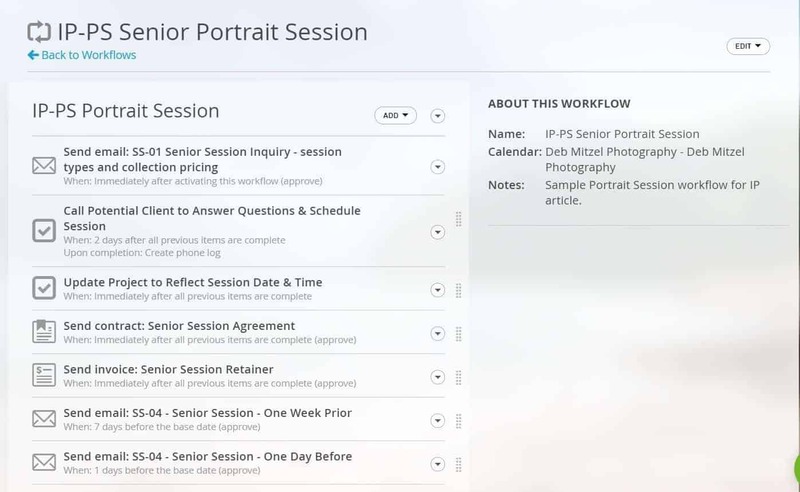 Your specific process may include different elements, but by the end of this article, you will have the knowledge to effectively design your own customized portrait session workflow in 17hats. For this article, I will assume you’re already using 17hats or a similar program. However, if you’re not familiar with 17hats, it is a business management software system designed to help manage your contracts, invoicing, contact management, and workflow. If you’d like to take a closer look at what it can do for you, visit www.17hats.com. 17hats is not a sponsor of this article, but I have been a user of their system for a couple of years, so this information is based on my personal experience with the software. If you’re already using 17hats, you know that everything you do in the system begins with the creation of a project. For practical purposes, a project would typically be a Portrait Session, Senior Session, Family Session, Wedding, etc, and all of the workflow activities for that particular project would be included in it. • Send session and pricing information. In the above scenario, there is only one element for which a time is needed, and that is the session date. Everything else can be triggered on a date alone, even if it’s a different date than the session itself. The Project date and time would be the session date and time, and the workflow would allow you to send a reminder email for the session, and include the specific date and time of the session (project) in your email template. The main limitation of the 17hats software comes into play when your workflow incorporates more than one date AND time scenario into your project, e.g. a workflow that includes a pre-session consultation and an IPS (In Person Sales) session. 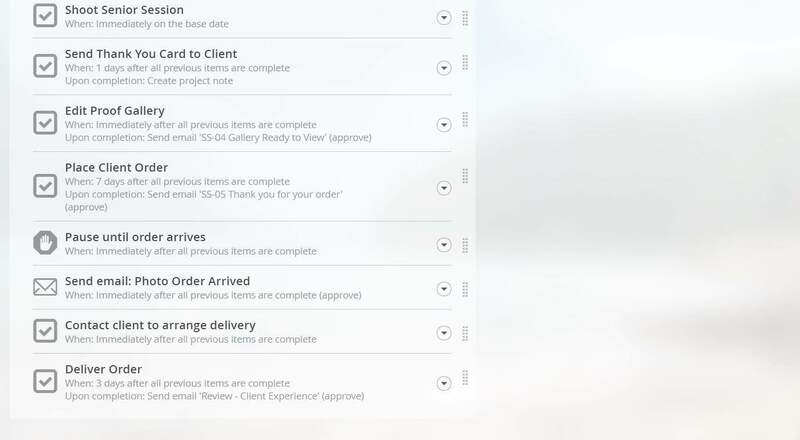 In these cases, if you want to use 17hats to send reminder emails for each of those specific appointments (including date and time), you would need to create a separate project for each one. We will discuss the mechanics of this a little later, but first let’s walk through the three elements of a 17hats workflow – To Do, Action, and Pause. Pause – this element is used to insert pauses in your workflow, perhaps while you're waiting for interaction from the client before you start the workflow back up. As an example, if you’re a wedding photographer, you may want to pause your workflow between the initial booking of the wedding and the month or so leading up to the wedding. There may be a number of workflow items you need to initiate early on, but then there will be a lull until you get closer to the wedding date. 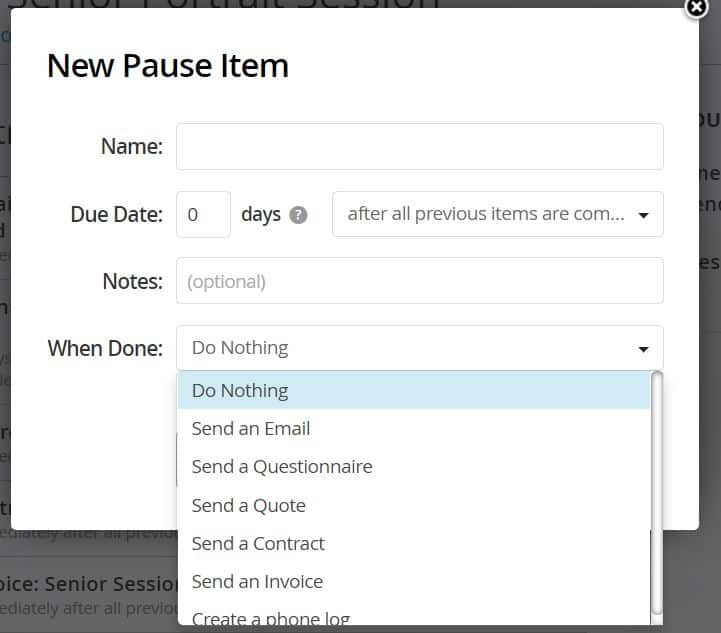 Inserting a pause into the workflow keeps those items off your radar until you need to address them. For each of these workflow elements, you have the ability to choose when the system will trigger it. 17hats triggers activities based upon the base date or interval of time before or after the base date. So, for example, if your workflow base date is your session date, and you wanted to email a “What to Wear” guide two weeks before the session, your due date for the Action item would be 14 days before the base date. You assign a “base date” to each workflow when you add it to a project. Many times this will be the same date as your project date, but each workflow can have a different “base date” that can be used to trigger the activities in that workflow. Basic portrait session workflow using one project within 17hats. The original workflow steps and the elements to be used within 17hats for each step are outlined below. As I mentioned earlier, there are some limitations when it comes to having multiple dates and times associated with one “project”. For example, most of us would consider a Senior Session a project, not each individual step in the workflow. However, with the date and time limitations of 17hats, and the fact that I have more than one appointment associated with my sessions (consultation, session, and IPS session), I have created a workaround to allow me to send appointment reminders to my clients for all appointments associated with their sessions. In a perfect workflow world, I would be able to create a project for my senior sessions, and input the session date and time as the project information. Within that project, I would have different workflows for each step in my workflow, e.g. Booking, Pre-Session consultation, Senior Session, Reveal & Order Appointment, and specific dates and times associated with each. Because I like to send email reminders for the pre-session consultation and the reveal and order appointment, having the date AND time fields within each workflow would be very helpful, however 17hats currently does not have the time field, so workflows can only be triggered on date, not time. To illustrate, all items within a particular workflow are based on the “base date” of that particular workflow, not the project itself. This means that you can have many workflows within a project, and as long as you put in the proper base date for that workflow, your events will trigger properly. The limitation comes in when your event also requires a time, in addition to the date. There is currently not a field within the workflow itself to put in the specific time related to that workflow. What this means is that you could potentially send an email reminder to your client for a meeting, but before it goes out, you’d have to manually input the time. When I first started using the software, that is what I did, but that got old in a hurry! The only place you can currently enter a time within 17hats is in a project, so if you want to time information in your workflow templates, you will need to create a separate project for each part of your workflow that requires a time. The workaround I came up with was to create projects for each item in my workflow that required a new date and time. This is not ideal for a couple of reasons, but until 17hats gets the time field added to the workflows, it is a much better solution than having to manually edit every appointment reminder that goes out! Workflow triggers are based on number of days from the “base date”, but template fields that include date and time pull the information from the “project date and time”, so if items in your workflow include templates with different dates and times, you will need a separate project within 17hats for each one. For example, if your workflow includes a pre-session consultation, the session itself, and a reveal and ordering appointment, all three of those items will need to be a separate project in 17hats in order to populate your templates with info based on the specific date and time of those events, i.e. appointment reminder emails. In order to keep them all within the same project in 17hats, each trigger would have to be a certain number of days before or after another date. For example, if your project date was your session date, in order to send an appointment reminder for the pre-session consultation, your consultation would always have to be scheduled a certain number of days before the session date. We all know this isn’t practical, which is why I have decided to use the project workaround. Examples of my projects and workflows are below. Illustration of multiple projects within one contact to accommodate the multiple meeting dates workaround. Workflow for Pre-Session Consultation project using 17hats workaround. Workflow in Reveal & Order Session project using 17hats workaround. 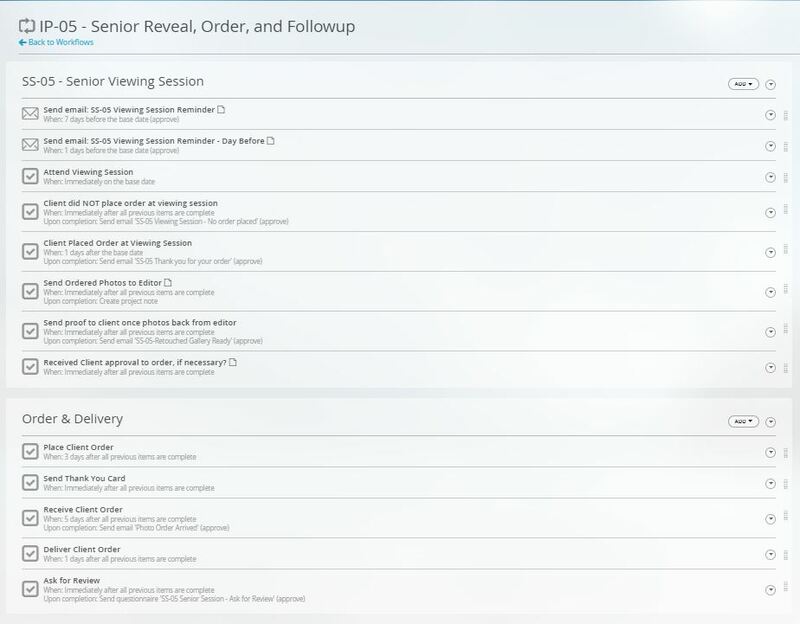 Remainder of Reveal & Order Session workflow ini Reveal & Order Session Project using workaround. The main issues I have discovered with creating additional projects are below. Knowing the limitations of the process can help you decide the best approach for your workflow. Related contacts don’t populate from one project to another, so if I want a parent included on all communication, I need to add them manually for each project. It doesn’t take too long, though, because the system will drop in the information once you enter their name. Organization – having multiple projects creates a lot more “stuff” in my client’s profiles, and can be confusing when trying to find emails and other items related to their session. Staying consistent with your use of each project and the activities that you include in each will greatly help with organization. For example, always send invoices and contracts from the same type of project so you know where to look for it. This time limitation is one of my biggest pet peeves with the program, but the workaround allows me to do what I need to without too much extra work. 17hats is still a very young company, but they are always working to make the product better, which I appreciate. Dates & Times – Workflows reside inside projects, and while each workflow can have a separate base date within the project, there can only be one time associated with a project, and that is the project date and time. Event Triggers – 17hats, like many productivity tools, triggers activities based on events or elapsed time. 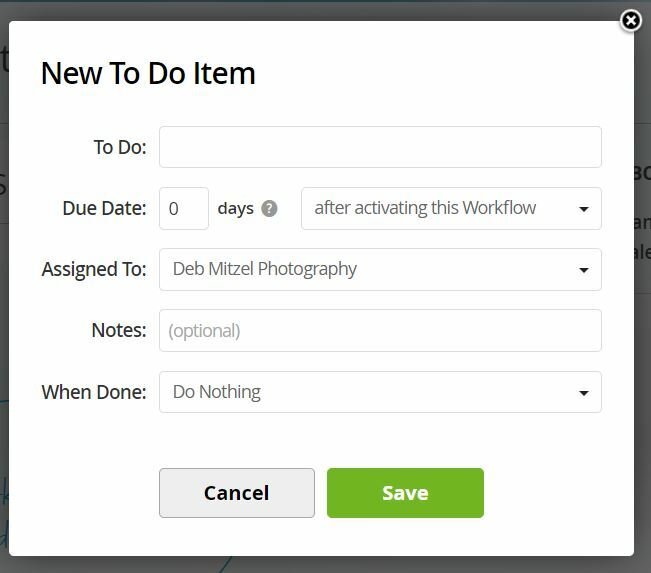 For example, a workflow item may trigger based on the previous item being completed (e.g. an email being sent, a contract signed, etc), or a certain period of time passing. For example, your workflow could be designed to send a thank you email 2 days after the client's session. 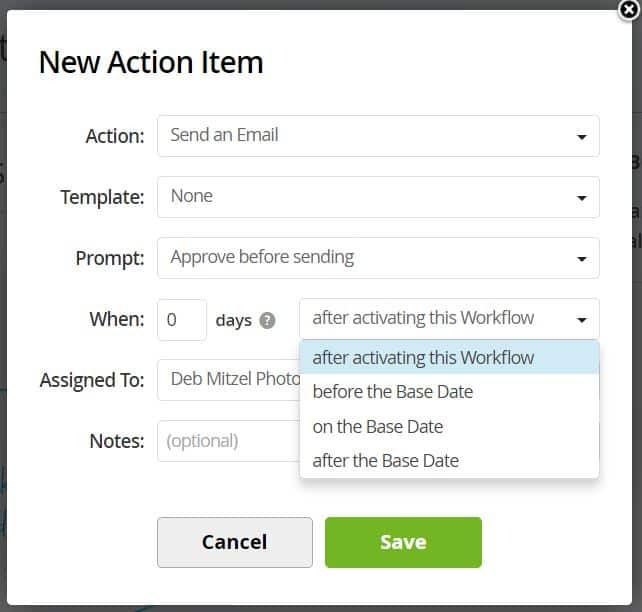 In order for this to happen, the base date of the workflow would have to be your session date, and an action to Send an Email would be set up for 2 days after the Base Date. 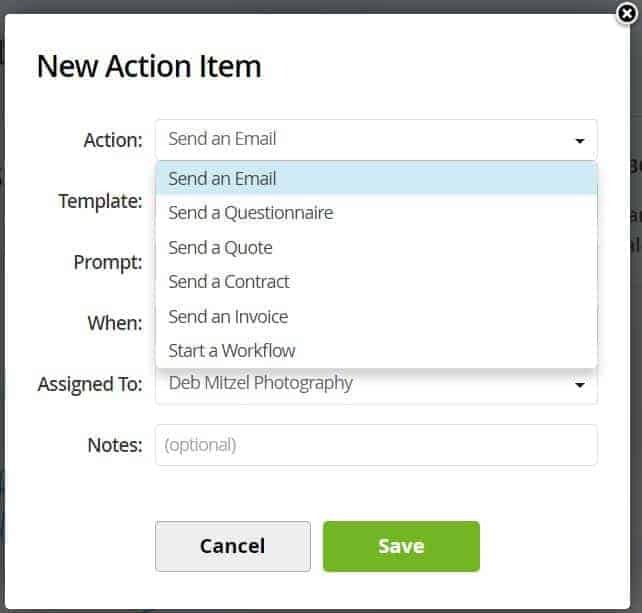 New Action Items can be triggered on a number of options to fit your workflow needs. Quotes – To minimize the number of emails you send clients, use the quote feature if you need to send an agreement and an invoice. You’ll start by creating a quote in your templates that attaches the correct contract and invoice to the template, and then make sure you have also created a template for the email you want to send along with the quote. 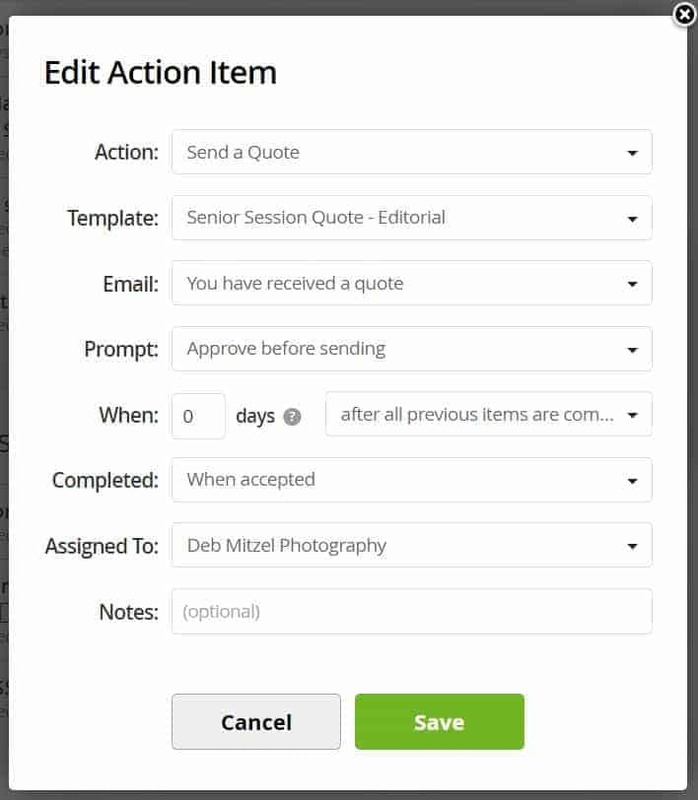 Once you have these templates set up, you can Add a Quote to your workflow as an Action, then choose your Quote template and the email template you want to send with it. Following this method allows the client to receive only one email for both of these documents. Once the client accepts the quote, the contract is ready to sign and the invoice ready to pay. There are a number of business management software programs out there that are similar to 17hats, so even if 17hats isn’t your program of choice, chances are these workflow tips will apply to your program as well. I have a day job in addition to running my photography business, and 17hats and the workflow piece of the system specifically, have become invaluable for my business. I would love to hear your thoughts on workflows, as well as any other questions or comments you may have about using 17hats. If there’s enough interest on a specific topic, it may become the subject of a future article here on Improve Photography.